While there are a few surprises here and there, once again the theme of today's polls is stability in the race for the White House. John McCain narrowed his gap significantly in today's Zogby tracking poll, drawing from 9.5 points behind to 5.3. As you probably know, I have a signifiacnt critique of Zogby's weighting mechanism, which assumes that the partisan identification breakdown will be roughly equal to 2004, when about the same number of Democrats and Republicans turned out for the election. 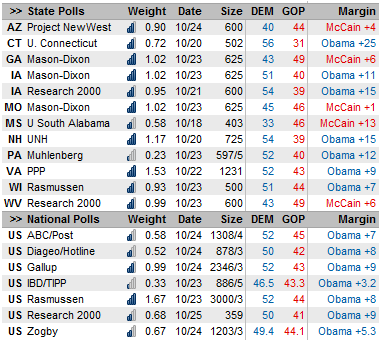 Neverthless, McCain also improved slightly in the Research 2000, IBD/TIPP, and ABC/Post polls. On the other hand, Barack Obama gained a point in Hotline and the Gallup "Likely Voters II" model (though not Gallup's "traditional" likely voter model), and remains at his high-water mark in Rasmussen. If the balance of today's national polls contain better news for McCain, the balance of the state polls show Obama continuing to perform very well in several swing states. Obama now has 15-point lead in New Hampshire according to the Boston Globe / UNH poll, which had generally contained good news for McCain earlier in this cycle. PPP puts Obama up by 9 in Virginia, while two new polls also show him with significant leads in Iowa. Meanwhile, an Arizona poll for the Democratic strategy firm Project New West shows John McCain ahead by just 4 points there, and a couple of other polls showing a close race in McCain's home state are apparently on the way. In terms of our model, the principal effect of the Arizona polls is not really in the Grand Canyon State, where our model remains skeptical of an Obama upset, but rather in terms of its neighbor New Mexico, where our it is now (even) more optimistic about Obama's chances. Counteracting the Obama trend sightly are new polls in Wisconsin and Missouri, which show somewhat better numbers for McCain than other recent polls of those states. However, that is not enough to prevent McCain's win percentage from drifting downward to 3.3 percent.